Well this year’s GreazeFest was an absolute corker! I’m glad I took the Monday off work to recover because it was a huge weekend and I must admit, by Sunday night when it was all over I’ve never been happier to see my PJs! Still it was definitely worth it, as always, and I can only count down til the next one! Lucky there’s a few great shows in between to keep my going. But enough of that, what happened at GreazeFest!? 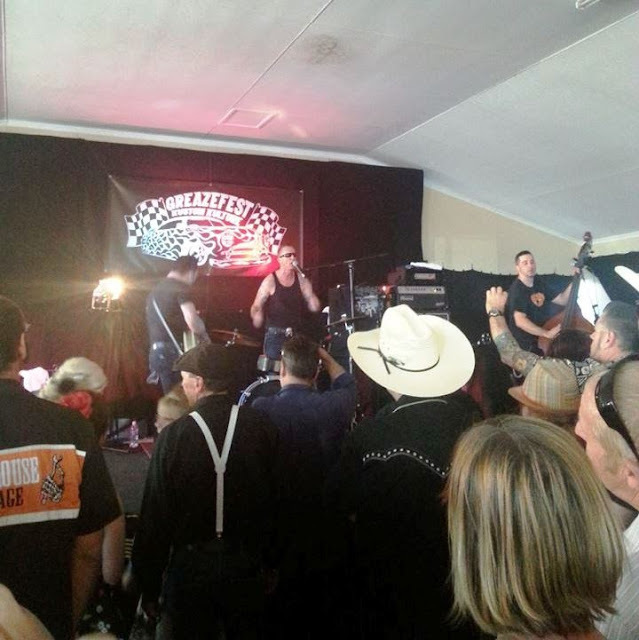 We arrived to the Rocklea Showgrounds for the first night of Australia’s most awaited Rockabilly and Kustom Kulture festival just as The Hi Boys were finishing up their set. Immediately we were set upon by lots of excited friends who were dressed to the nines and we grabbed a drink and caught up while The Satellites pumped out some fantastic tunes. Before we knew it our favourite space men, Men Into Space, had taken to the stage for their out of this world set featuring favourite covers like Planet Claire, their own original tracks (one of my faves is My Girlfriend’s Hot For Spock) with the unmistakable sound of the theremin and a guest appearance by The Boobettes!! That would be the dynamic duo made up of myself and the lovely Elisse, for a lend of our most capable lungs for some B-movie screaming during a song. It was lots of fun and is becoming a bit of a regular spot for us at their gigs. 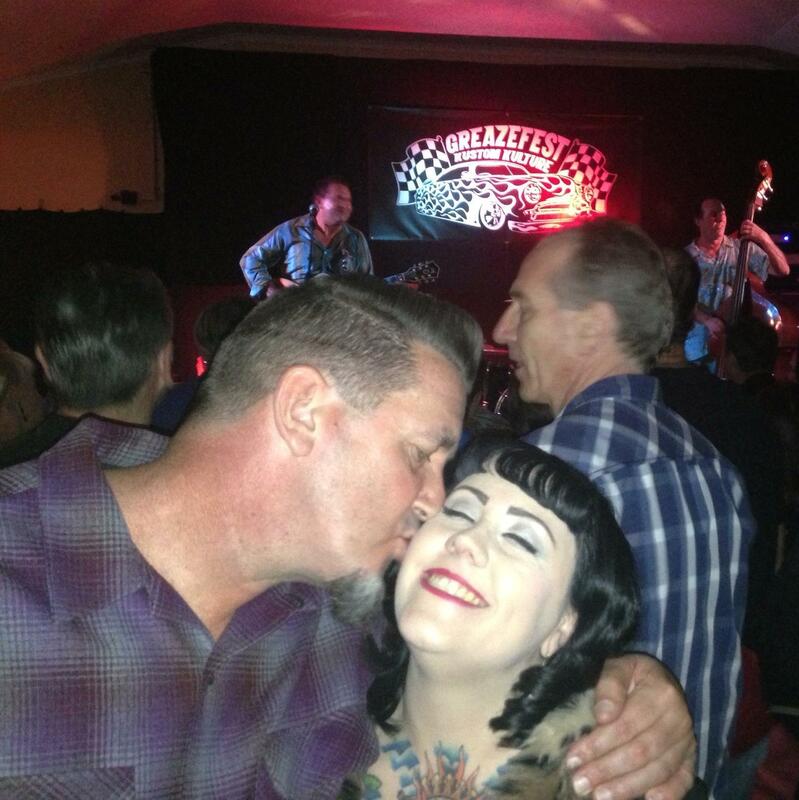 We didn’t have much time to catch our breaths before one of my favourite Aussie rockabilly bands took to the stage to bring the house down. The Detonators are one of the bands that I was most eager to see over the weekend and as the final act on Friday night they certainly didn’t disappoint, playing all the crowd favourites including Time Machine, Hot Rod Tip Truck, Jason You’re a Lout and many more. By the end of the night I’d almost lost my voice from screaming, I had such a great time! Awake bright and early on Saturday we headed for the showgrounds, eager to see what the first Saturday daytime hot rod show would be like. It was less busy than the Sunday usually is, so it was a great chance to get around some of the cars and stalls without the crowds. We did just this, whipping around all our favourites and enjoying the sounds of A Band Called Twang before we headed off for our official duties in the Fashions of the Fest fashion parade. The Man was once again one of Bernie’s Cowpunkabillies while I got to model some beautiful Freddie’s of Pinewood threads for Western Wac along with Mz Vicki, Billie Bossanova, Juanita and Kimmy D – Miss Western Wac herself. It was lots of fun and by the time we were done we’d worked up a real appetite. Stopping for some DELICIOUS Brazilian food, we fuelled up for the rest of the afternoon, heading inside to catch the last few songs of Matt Dwyer’s Little Big Band and making sure we were in prime position for Doubleblack. I first saw these guys open for The Reverend Horton Heat a few months ago so I was really looking forward to seeing them again. I still thoroughly enjoyed their set but unfortunately the crowd wasn’t there in numbers or enthusiasm and I think the later timing of their set was the cause, as many people had gone home to prepare for the night ahead. Not me though! A stayer til the end, I took a wardrobe change in the car and got my hair and make up done so that I wouldn’t have to leave. Now that’s planning ahead! While the crew prepared the venue for the transition into night, DJs kept the tunes spinning and I was transformed. By the time I was ready and we got inside, Hanks Jalopy Demons were tearing it up. I love these guys and have unfortunately only seen them live once before so was a little disappointed that I’d missed most of their set but that was just my bad timing. While The Flattrakkers played their revved up brand of rockabilly we grabbed some drinks and said hello to some friends who hadn’t made it the night before. Next up was the Pat Capocci Combo and they were the perfect soundtrack to the many silly photos taken that night. I was keen for a dance but having been on my feet all day ended up needing to sit down more than I would have liked. How is it that I know so many good looking ladies?? But I was saving myself for the moment of the festival, when The Paladins took to the stage. Their only Australian show and their first in about 8 years, they played a HUGE extended set packed with all their most loved tracks including Daddy Yar. For older guys, they sure can ROCK and their playing was amazing! They were pouring sweat and played for AGES and the crowd just ate it up. I remember looking around the dancefloor (which was PACKED) and seeing SO many grinning faces. I also really enjoyed seeing so many muso’s down there and taking it all in. You could see the awe in their faces and the crowd were more than appreciative by the time The Paladins wrapped up their set. By now I was definitely hoarse. 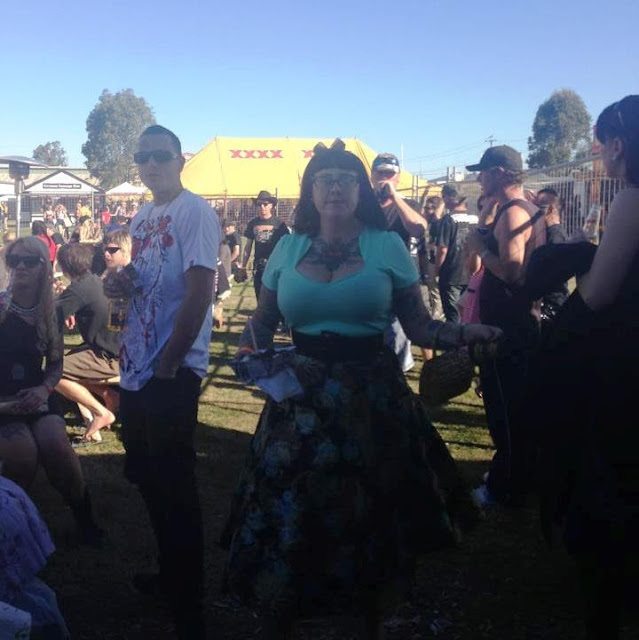 Another early morning and slightly hungover, we headed back to the showgrounds for the final instalment of the GreazeFest Kustom Kulture rockabilly weekender. We spent a lot of time wandering around catching up with a few more people, taking a second look at some of the stalls and combing our way through the cars. USA pin up photographer Susanna Vestige also used The Tank for some shoots in the afternoon so we spent a little bit of time making sure she was all set up for that. By now it was feeling like a rather long weekend and my poor little tootsies needed a rest so I spent a while sitting down and just chatting with friends having a drink and enjoying the music. However when it was time for The Chop Tops to come on I was straight down the front. Having already seen these guys once at Morningside I knew we were in for a treat and there was no way I was going to miss it. A fantastic blend of traditional rockabilly and more modern psychobilly, this trio pack a punch! With a sound and guitar work that’s reminiscent of early Reverend Horton Heat and the Stray Cats, these guys played their hearts out with a hugely energetic set that was just what I needed to get me back into the mood. With a set that could only be described as manic, The Chop Tops drew a crowd with Shelby’s fast-fingered guitar work, Sinner’s crazed stand up drumming and Brett’s string-slapping skills. I missed out on getting a CD at their last gig (they sold out – that should tell you something!) so I was definitely going to get one this time! And I did, although since listening to it I’ve noticed that the album lacks the rawness that I love so much about their lives shows. There’s still plenty of great tracks on there, just expect the sound to be a little more polished than the out-of-control good times of their live sets. After all that excitement I needed another sit down so we took the opportunity to hang out in the Hula Lounge and once again admire the amazing artwork on display in the Lowbrow Art Show. Determined to see the festival out with a bang, we made sure we were down by the dancefloor for the final act of the weekend – Paulie & His Crazy Rhythm Boys. Once again, it was a cracker of a festival. I know I say it every year but it really does get bigger and better each time, particularly with the new addition of the Saturday Hot Rod Show and trading. Although I did miss the car cruise out to Goodna just a little bit, I can certainly see how another day of the car show really has the opportunity to take the festival above and beyond. It’s an absolutely huge job to pull it all off and yet every year Lori Lee and the Robot crew manage to pull it off without a hitch. It is hands down my absolute favourite Australian rockabilly festival and I look forward to it so much every year so for that I am grateful.